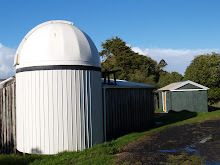 Kumeu Observatory Log: Second New Window and carpet! The downstairs area has just had a makeover. I have put in a second window to allow light and afternoon sun in to keep the place warmer and drier. We also put insulation in two of the walls so should be warmer all night. Many thanks again to Peter our neighbour and Guy Thornley for help wrecking the old wall to get the framing done and the carpet down. The carpet was provided by Paul Kemp several years ago but we have just been slack, until now. The whole area now feels totally different and cleaner. Now we just have to find some planets!